Buddhism was born in India, but 800 years ago it virtually died out in its birthplace. 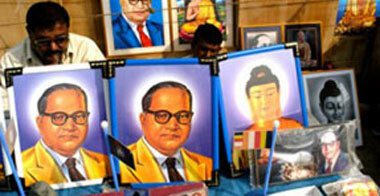 In the twentieth century it has been spectacularly revived and there are now over ten million Indian Buddhists. The vast majority of these people are from castes formerly known as 'untouchable' who were involved in the movement of conversion to Buddhism initiated in the 1950s led by Dr Bhimrao Ramji Ambedkar. Born into the 'untouchable' community, Ambedkar received an education both in India and later in the UK at the London School of Economics and in the US at Colombia. On his return to India he advocated for the abolition of the caste system as part of the country's movement to democracy. His views weren't popular with most of the high caste leaders of the independence movement but Ambedkar fought succesfully for various concesssions and went on to authorIndia's new constitution in his capacity as independent India's Minister of Law. In addition to his politcal efforts, Ambedkar's rejection of Hinduism's 'graded inequality', led him to explore the possibilities of an alternative spiritual belief system which would offer the 'untouchable' community a way to escape the degradation and slavery of the caste system. He found it in Buddhism and in 1956 facilitated the conversion of 380,000 men and women. One of the most prominent Buddhist movements in this community is Trailokya Bauddha Mahasangha Sahayak Gana (TBMSG) which is known in the West as the Friends of the Western Buddhist Order (FWBO). Buddhism continues to speak to indviduals from india's 'untouchable' communities and to offer both a spritucal alternative to Hinduism and a focus for practical support for community development. This interview with Dharmacari Kumarjeev, one of the founders of the Dhammakranti movement in India, provides a very contemporary take on the continued relevance of Buddhism to India's unotuchables and the ongoing problems of caste.